When you live in a neighborhood, your actions as a homeowner are seen by your closest neighbors. If you want to live in a community that is safe, responsible, and a place you love to live in — it all starts with you! Set an example for the rest of your neighbors by doing the following things with the hopes that they mimic your actions. Place your provided trash bin at the edge of your driveway near the curb to allow for an easy pickup. Keep ALL trash inside of your bin. Do NOT leave extra garbage bags and additional trash outside of the bin. Make sure your bin’s lid is closed and secure. An open lid could tempt pests like raccoons and opossums to come and look for their next meal — which could end up with them terrorizing the neighborhood. 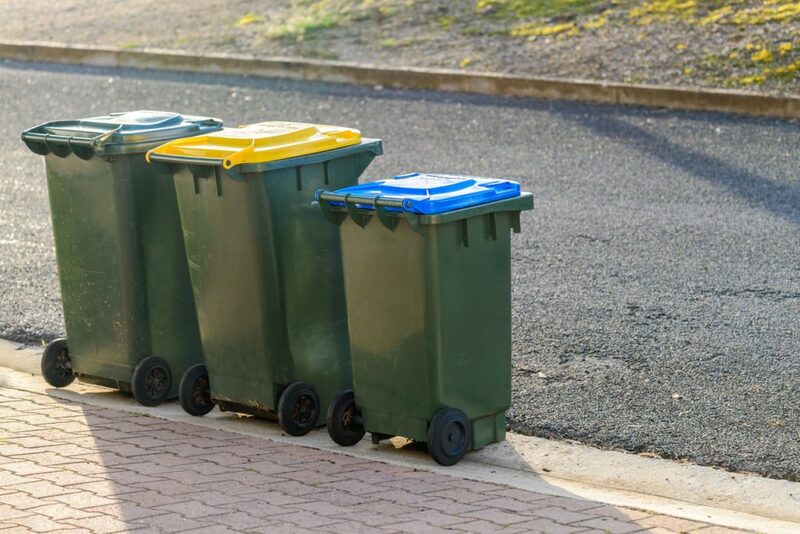 If you have too much trash to fit in your bin, contact your local trash removal service to schedule a dedicated pickup for large quantities of garbage. Keep recyclables separate from your trash by sorting through your waste and placing everything in the appropriate trash and recycling bins. Do not FILL your recycling container. Why? If you’re filling (or even overflowing) your recycling bin, this means you’re using too many products that aren’t reusable. Start using things like reusable water bottles, reusable food containers, etc. Clearing clutter from your home, remodeling different rooms, replacing your roof, and cleaning up your yard all leave you with an abundance of waste that will need to be removed from your home. The most responsible way of removing this waste from your home is to rent a dumpster. Renting a dumpster means a company will drop it off for you, you fill it up, and that same company will pick it up for you for a flat fee. This will help keep your neighborhood from being filled with piles of waste by keeping everything in one location (the dumpster). Your neighbors will appreciate this and the sight of the dumpster will remind them to rent one when it comes time for them to remove large quantities of waste from their home and property. When you have good habits, your neighbors will take notice, and your neighborhood will become a cleaner and better-looking place to live! For more information related to trash removal, recycling, or dumpster rentals — don’t be afraid to give us a call! We’d be more than happy to help out the people within our community!